The Wales Window at 16th Street Baptist. I tested the door to the 16th Street Baptist Church and, to my surprise, felt it yield. Slipping into the back of the sanctuary, I stared again at the right side stained glass depiction of Jesus – the way it looked before the face of Christ had been blown out by a white supremacist bomb, the one that killed four African-American girls on that horrific Sunday morning a little more than 50 years ago, on Sept. 15th, 1963, in Birmingham, Alabama. The window had been pointed out to me a couple of hours ago, by a friendly woman who seemed happy to discuss the sanctuary with me, even after she realized that, despite my Southern accent, I lived in New England now; if my whiteness made me an unlikely prospect for membership, geography finished my chances. I’d told her how, even though I taught at a Catholic college in Massachusetts, I was from just down the road in Tuscaloosa, where a group of our students was helping rebuild my hometown after a catastrophic April 27, 2011 tornado. She nodded; folks around here remember that storm system almost as much as the bombing. I told her I was waiting for said students to arrive for a tour of the Civil Rights Institute across the street, and she volunteered that many tour groups worshipped at 16th Street Baptist on Sunday mornings before touring the institute and Kelly Ingram Park. I shrugged and said we should’ve done that; she volunteered that we might poke her heads in the door, even though there was no tour. Now, a couple of hours later, here I was, with about half the student group behind me, weighing the choice. Well, the doors were open, and it was a church, after all. It was supposed to be open to the community, was it not? Likely folks were meeting elsewhere in the building, while practicing good energy conservation in the sanctuary. Plus, the hard-working students who had come down to serve were all seniors – who knew when, if ever, they’d make it this far into the South again. They respectfully followed me into the back of the sanctuary, listened to my inadequate explanation of both the original stained glass window and the Wales Window, a stained glass depiction of a black Jesus Christ donated to the church by the people of Wales. Then, from up a stairwell, a voice. We retreat to the door as a woman comes up. She seemed relieved to see it was just a frousled professor and a few college kids. Apparently she’d been alone downstairs when the alarm went off. “I’m sorry, the door was open,” I said, and went into an explanation that used the word “sorry” several more times while sheepish students edged toward the door. So she walked us down into the basement where the girls had been when the blast went off. 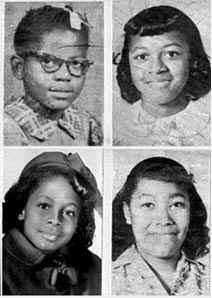 In the back, between the two sets of stairs, we took in the pictures of the martyred girls – Addie Mae Collins, Cynthia Wesley, Denise McNair, and Carole Robertson – and the clock still frozen at 10:22, the moment of the blast. She told us about how in those Bombingham Days, they’d kept guard against the possibility of a bomb being planted, only to have the activities of Youth Day at the church interrupt the routine. How they got a warning call from one of the bombers saying they had five minutes before the explosion, but the bomb went off in less time than that, too soon to save the children getting ready for their part in the service. How three of those girls weren’t even members of 16th Baptist. How she herself had been a child in the congregation that day. Walking out, I apologized again for giving her a start, adding that I’d been surprised a time or two myself back when I had the deacon duties of checking the locks and light switches. I told her also how much it meant, how these students would always remember this. She gave me a half hug. “The Lord meant for this to happen,” she said, and waved a cheerful goodbye. That night in Tuscaloosa we ate ribs at the black-owned Dreamland Inn Bar-B-Q in a neighborhood known as Jerusalem Heights. Conversation flowed as freely as the sweet tea and barbecue sauce. Looking at the laughing group, I worried, as I had the last two years we had done this, what would survive of their experiences once reflection time back at the lodge rolled around. I needn’t had worried. Two nights earlier, they’d seen a video of the tornado and its aftermath, and someone had wondered how people interviewed kept their faith after having loved ones snatched away only a few feet from them. This night they discussed how people kept their faith despite the suffering inflicted by other humans. Yet, in both cases, they did. The students also marveled at how, at the Institute, a man overseeing the oral history room had abruptly declared that he wanted to show us something extra – and took us downstairs to a display of winning pieces of art inspired by Spike Lee’s documentary Four Spirits, about those four girls. Not to mention our surprise church guide – who the students fully expected to kick us out with characteristic abruptness. 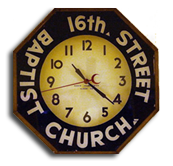 Later, when I looked at the website for 16th Street Baptist – “Where Jesus is the Main Attraction” – I couldn’t help but smile at the title of the pages depicting the church’s history. 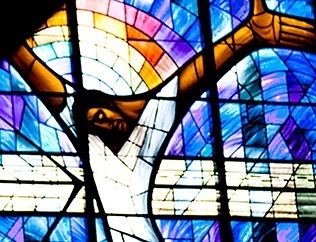 That night, we’d discussed how, in his “Letter From a Birmingham Jail,” Rev. Dr. Martin Luther King Jr. challenged his counterparts in the white clergy. “The contemporary church is so often a weak, ineffectual voice with an uncertain sound. It is so often the arch supporter of the status quo. Far from being disturbed by the presence of the church, the power structure of the average community is consoled by the church’s often vocal sanction of things as they are. Judging from our experience, 16th Street Baptist is doing its part to keep the church relevant in the 21st. After all, they must tell. 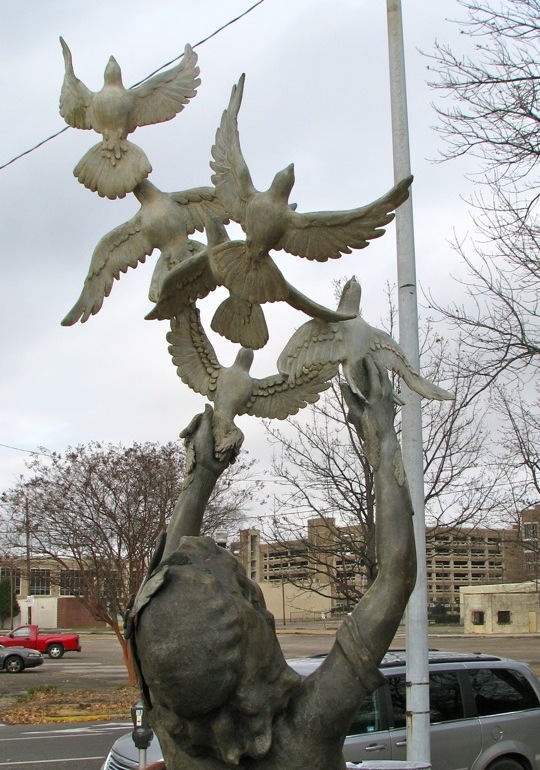 Part of “Four Spirits” statue across from 16th Street Baptist. Glad to read your story of a visit to this iconic church. Perhaps your students will value first-person stories and primary sources at http://www.KidsInBirmingham1963.org. Like us on Facebook and follow @KidsInBham1963. Check out the lesson plan at the Class Room tab of our Web site. Thank you for the tip on the website, which is fabulous. I’ve reached out to the students via Facebook in hopes some of them will visit the site as well.